We are a team of ASE certified mechanics that have created this guide to show you why your brake lights are not working and what you can do to fix them. This guide covers a simple bulb replacement and continues onto testing the brake light electrical system. How Do Brake Lights Work? The brake light system is a simple on and off exterior lighting system which is controlled by a brake light switch located near the top of the brake pedal. A simple wiring circuit is connected to the car's BCM and then onto the rear brake lamps (older cars do not use a BCM - body control module). This system is powered and protected by a fuse located inside the fuse panel under the dash or the power distribution center located under the hood. American made vehicles incorporate the car's blinkers into the brake light circuit. When the turn signal switch or multi function switch is operated the brake light circuit is substituted for the turn signal circuit for either right or left directionals. European and Japanese cars have a separate light and circuit for the brake and turn signal lights. 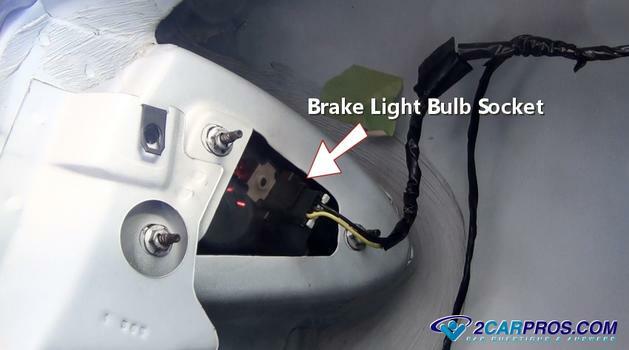 Let's start with the most popular repair which is replacing the brake light bulb and then onto troubleshooting connection and electrical problems. This will give you an idea of what you're in for before you begin. Then follow down the guide to pick up on additional tips and information. 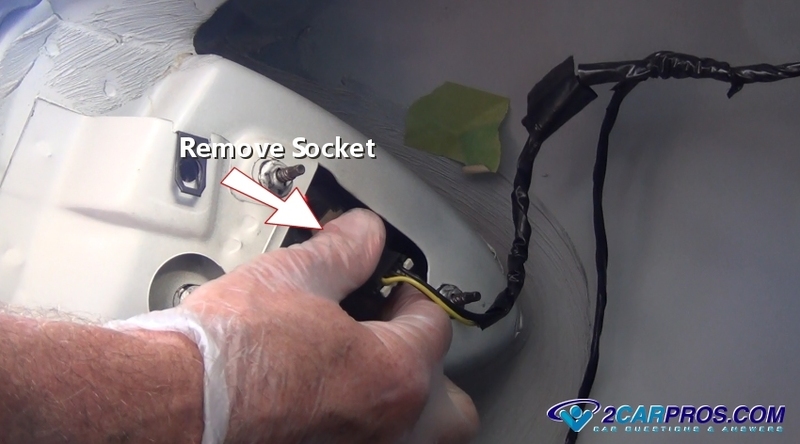 Remove the bulb: There are basically two styles of bulb replacements which are; The brake lens needs to be removed to access the bulb or the bulb socket can be removed by simply twisting it counterclockwise from the backside of the lens either through an access hole which is covered by a small plastic panel or through the trunk, lift back or hatch. We will show you both types and how to test the system in the following guide. Have a helper step on the brake pedal to confirm which brake bulb is out; right, left or high center lights. If none of the lights are working then the bulbs are probably not the problem. 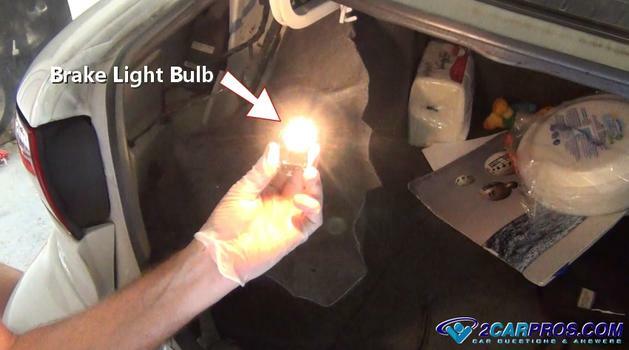 Although we have seen where all of the bulbs have failed simply because they had gone bad one at a time in a close time frame to one other and the car owner did not notice or was not informed of the problem by other drivers. When you see a person who has a stop light bulb out you should do the right thing and tell them. 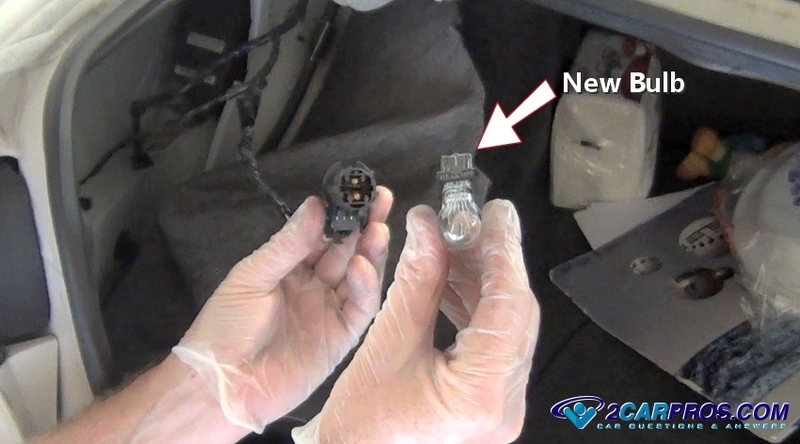 To begin you must determine which style of bulb replacement your vehicle has. This is done by inspecting the lens and looking for mounting screws which hold the lens to the vehicle which can be on the side of the lens. You may need to open the truck, hatch back, tailgate or lift back. If no mounting bolts are found on the outside of the lens they will be located in the inside of the rear body panel. 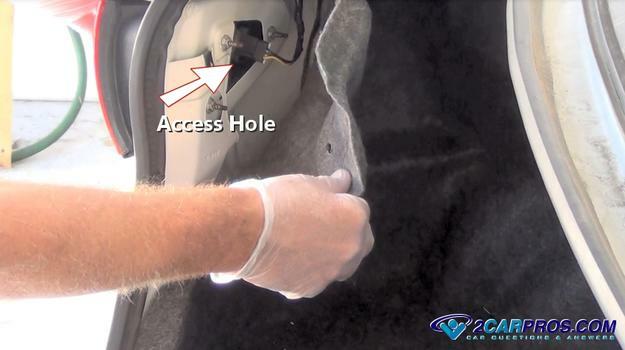 You may need to pull back the truck liner or remove a few plastic trim pieces before these nuts or the bulb socket is accessible. If no access hole is available you must remove the mounting bolts and remove the lens to gain access to the bulb. In the case below an access hole was provided by the manufacturer which makes the job a little easier. 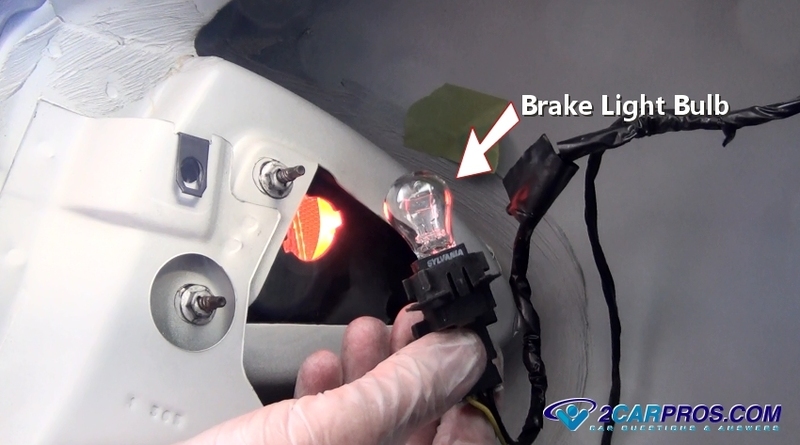 Watch this video of the brake light lens being removed to get an idea of how to do the job. Now that you have located the light socket and wiring harness the bulb is ready to be removed for replacement. On most American made cars and trucks this bulb has two jobs both for the brake light and the blinker indicator which will have three wires feeding the socket; brake, turn signal, and ground wire. On European and Japanese cars this job is handled separately which will have just two wires, brake light power and circuit ground. Grasp the bulb socket and twist firmly counterclockwise. This will allow the socket to come loose from the lens. Sometimes they can be a little stuck in which case you can use a pair of pliers to help break it loose. 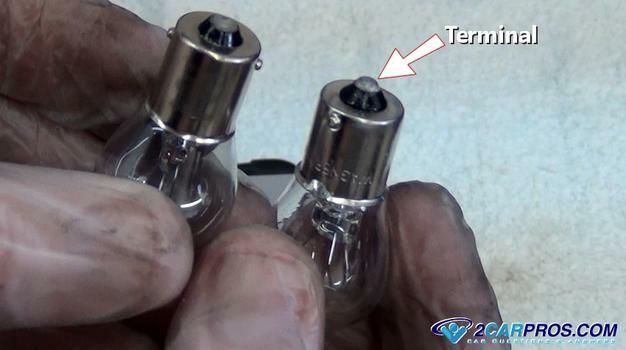 Once the socket has been removed it will expose the bulb which may have a burned mark or be light blue in color which indicates a leak in the glass. In either case the bulb is no good. Grasp the bad bulb and pull it from the light socket. Some bulbs you will need to push down and twist counterclockwise. Matching the New Bulb: Once the old bulb has been removed match it to the new unit, they should match identically. Pay close attention to the bulb terminals. 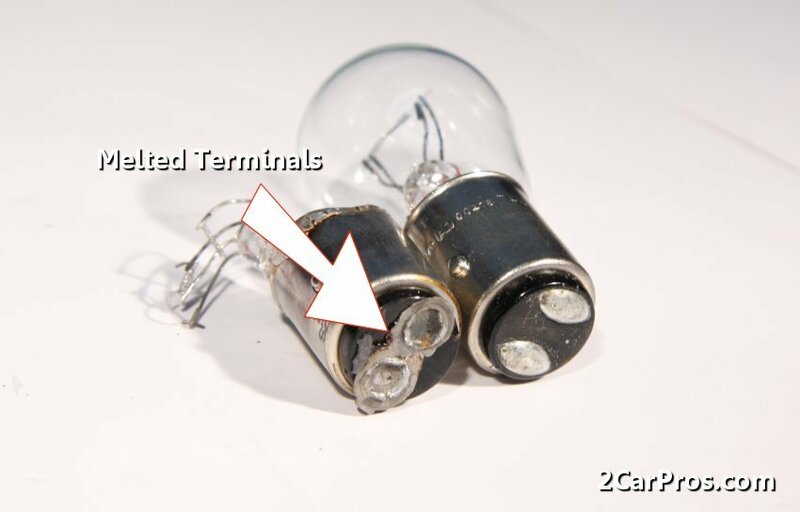 You do not want to install a two terminal bulb into the one terminal socket and visa versa. This can create circuit back feed problems and may possibly blow out the BCM or fuse. Install the New Bulb: Plug the new brake light bulb into the socket and have a helper push on the brake pedal to see if it works. If it does reinstall it back into the lens and reassemble and you are all set. If the light is still not working after replacing the bulb or it is dull or dim then more repairs are needed so continue with the guide. If a brake light flickers it's because the power or ground is being obstructed momentarily. The most common cause for this is a loose fitting bulb socket. While a helper holds down on the brake pedal move the bulb around slightly in the socket. If the bulb flickers replace or repair the socket. Also wiggle the wiring to check for opening wiring circuits. This is where some testing and observation is needed to repair a bad connection or broken wire. 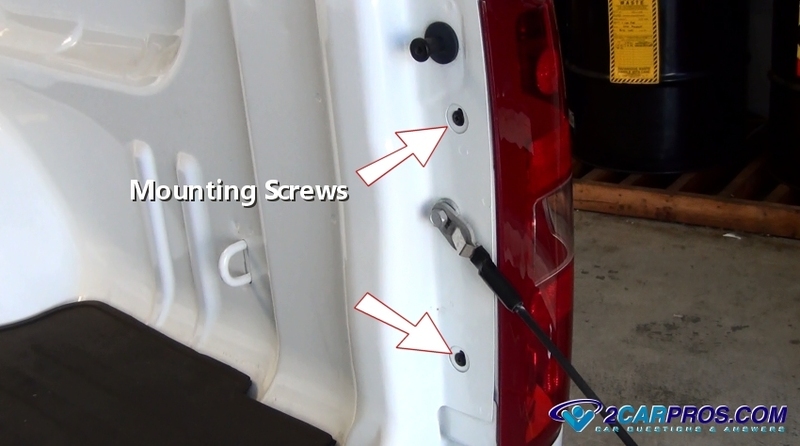 The first half of the guide will troubleshoot one brake light that is not working while the second half with troubleshoot all or the lower two brake lights. Test Brake Light for Power and Ground: Secure the ground clip of a test light to a known good ground source such as a bolt or solid metal piece. 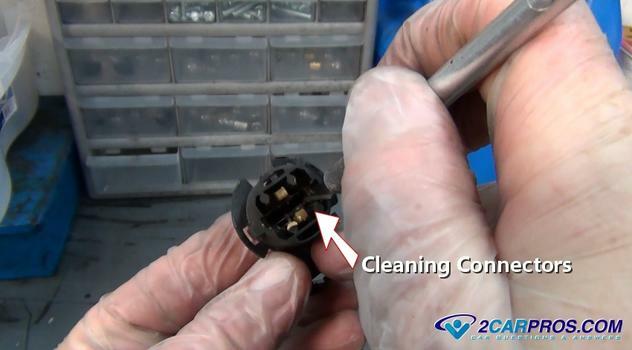 It's important to get a good connection free from rust or paint because the test light depends on this conductivity to work correctly which will give you a good test result. Wiggle the clip so the teeth of the spring loaded clip dig into the metal to ensure a good connection. Have a helper hold down on the brake pedal the remaining working brakes lights should be on. 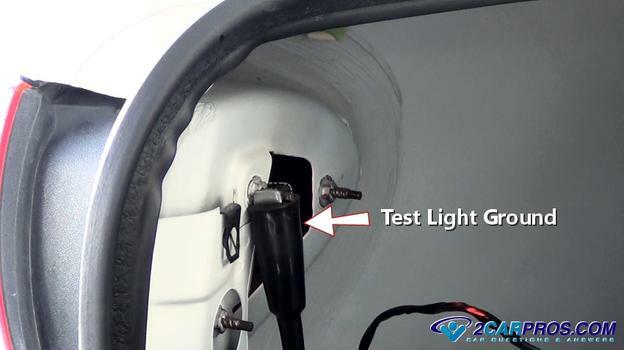 Use a test light to probe each of the brake light sockets feed wires; one of them should light up. If you cannot find power then access the opposite light that is working and probe the wires until power is found to confirm the test light is working. If power is present at the non working bulbs continue with the guide. If power cannot be found skip down to: "Testing Brake Light Power" in this guide. If you have power at the socket the next step is to check the system ground. Attach a pointed metal object to the test light clip and probe the brake light feed wire and the ground wire of the socket. If the test light lights up the circuit is working and the fault is in the bulb socket connections. If the test light does not light up there is an open connection in the ground wire. This will could make the bulb be dim, dull or not work at all. You can either make a new ground wire connection by cutting the wire and using a new wire to any metal part near the socket or follow the wiring harness and look for obvious damage or cuts in the wiring that will need to be repaired. Repair Bad Connections: The bulb socket could be subjected to heat and corrosion. 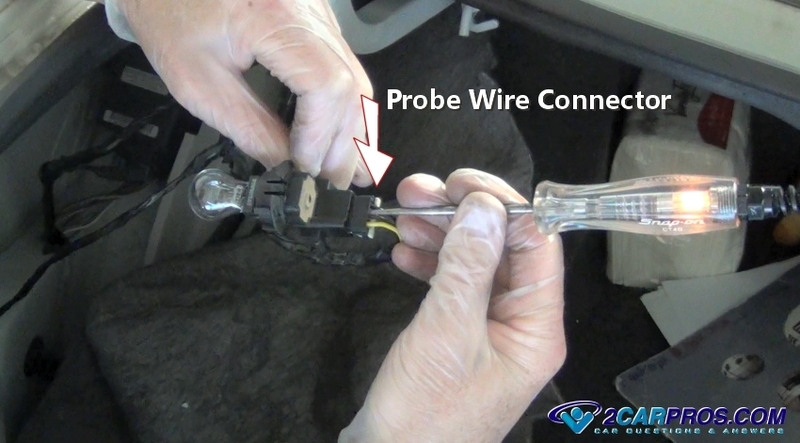 Remove the bulb socket and inspect the electrical connector for burned or melted terminals. This is caused by high resistance creating an open connection causing the bulb not to work. Manufacturers will install dielectric grease into the socket to help protect the connection but with time this clear or brown grease will melt out and expose the connectors to the atmosphere causing rust or corrosion which causes a bad connection. Use a sharp object such as an Exacto knife to scrape the connection clean. If the connections are loose the bulb will flicker and flash. Use a small flat blade (standard) screw driver to enhance the spring load of the terminals. This will help the bulb connect to the socket making the bulb to work again. If this socket is badly damaged it should be replaced. With all connections cleaned or socket replaced and the power and ground checked reassemble the socket and bulb onto the wiring harness. Have a helper step on the brake pedal to confirm the bulb operation. Then reinstall the bulb socket back into the lens and you are all set. Many lighting system bulb clusters have a connector which can melt due to poor connection which causes high resistance. This resistance can cause heat which melts the connector plastic creates a bad connection. The connector with pigtail will need to be replaced which you can get from Amazon or from the dealer for about $35.00 bucks. With the foot off of the brake pedal cut the harness and splice in the new connector. 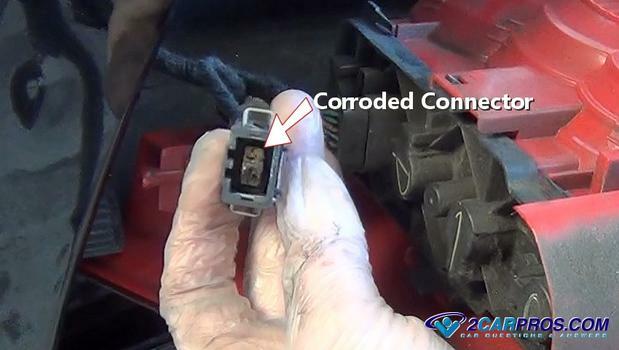 If the connector looks okay inspect the wiring harness and look for obvious damage such as a cut or wear mark indicating the harness has rubbed against a metal frame breaking the wire. If everything looks okay continue with this guide. This portion of the guide is to help you test for power when one, both lower or all three brake lights have no power. Test the Fuses: Use the owners manual or the lid of the fuse panel to find the brake light fuse. Then use a test light to check the fuses for the brake light and BCM fuses and replace if any are blown. If the fuse is blown it could be caused by a shorted wire to ground, a melted light socket or a weak fuse. 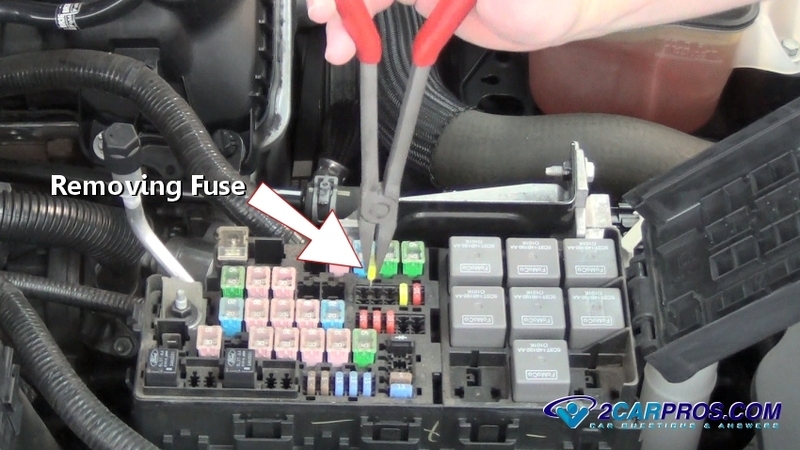 Check to see if the fuse is loose in it's holder which will cause a bad connection. Enhance the tension on the holder terminals to correct the problem. If the fuse is okay continue down the guide. Check the Brake Light Switch: On newer cars using a BCM or lighting module the brake light switch completes a ground circuit which triggers the lighting computer to supply power to the brake lights. 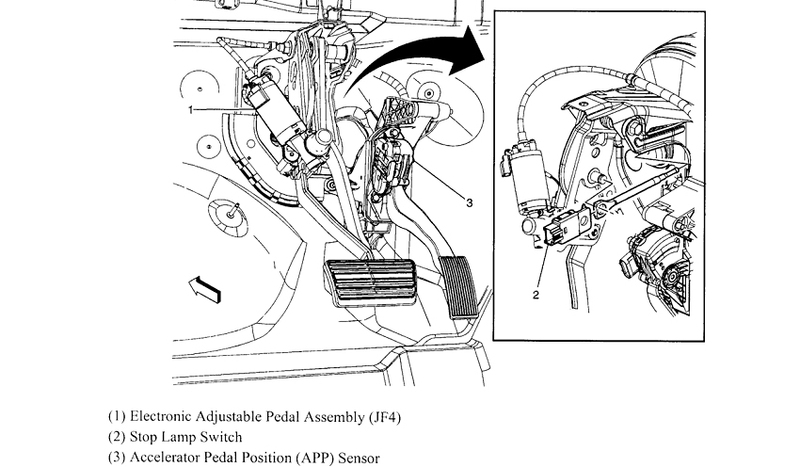 Locate the switch near the upper part of the pedal which will have wiring connected to it. Begin by inspecting the wiring harness and look for obvious damage such as a cut, wear mark or broken wire indicating the harness has rubbed against a metal frame causing the failure. Wiggle the wiring while pressing down on the the brake pedal to see if the lights start working. This would indicate an internal broken wire or bad switch. To test the switch use a test light and connect it to power and probe each of the two wires. One should be lit all the time while the other should light up when pushing the brake pedal down. If only one side lights up the switch is bad and needs replacement. On older cars this switch controls brake light power. 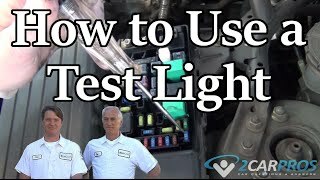 Perform the same test using a grounded test light. These switches are held in place by a metal clip and pin assembly which makes replacement about a 20 minute job in most cases and can be replaced with just a few basic tools. When it comes to electrical devices such as brake light switches, OEM (original equipment manufacturer) the parts work better and last longer. If the switch becomes out of adjustment it can leave the brake lights on which can drain the battery down. Since the brake light switch is used many times it will eventually need to be replaced. A brake lens and socket can melt and distort when the brake lights are kept on for an extended amount of time so try to avoid allowing the brake lights to stay on overnight. 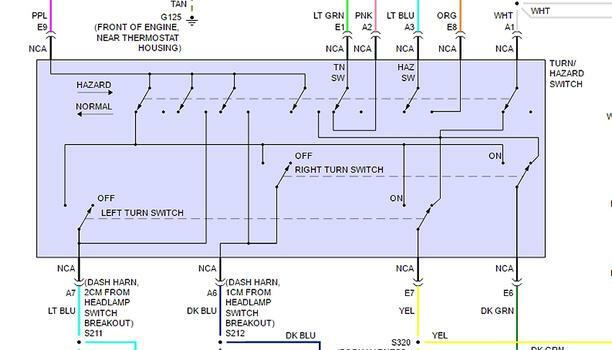 On vehicles using a lighting or BCM module use a wiring diagram to test the ingoing signal from the switch and the outgoing voltage to the lights. If the BCM has a brake light input signal from the switch and no outgoing signal the brakes lights the module is could be bad and replacement is required. If none of the lights are working check the fuse for the BCM or lighting module. 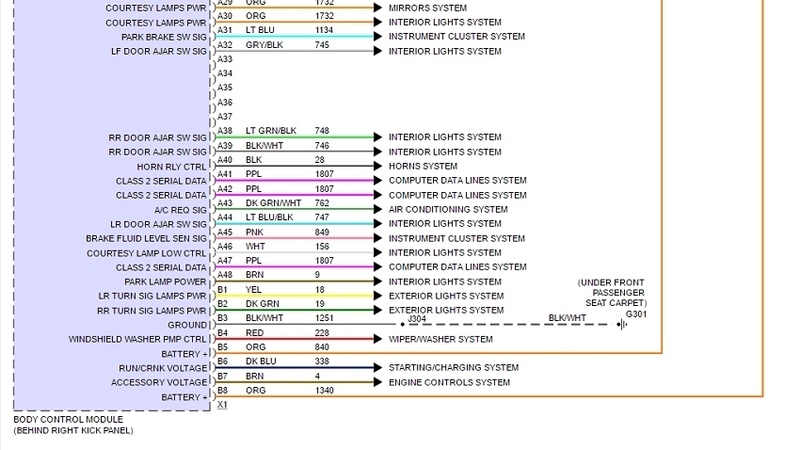 Here is a typical BCM wiring diagram with power outputs going to the brake lights. They are listed as LR Turn Signal (YEL) and RR Turn Signal (DK GRN) which are the same as the brake lights on this car. To test the BCM power output connected a ground test light and probe the wires to confirm power or not. Test the Turn Signal Switch: On older American vehicles the brake light circuit is routed through the turn signal switch which can go bad not allowing the currant flow to continue to the brake lights. Most American cars are designed with the lower brake light circuit wiring incorporated into the turn signal switch where the brake light bulb and the turn signal bulb are one and the same. The turn signal switch interrupts the brake light circuit and installs the blinker circuit when the switch is activated. Using a wiring diagram test the color wires that are ingoing and outgoing to see if the circuit is working. 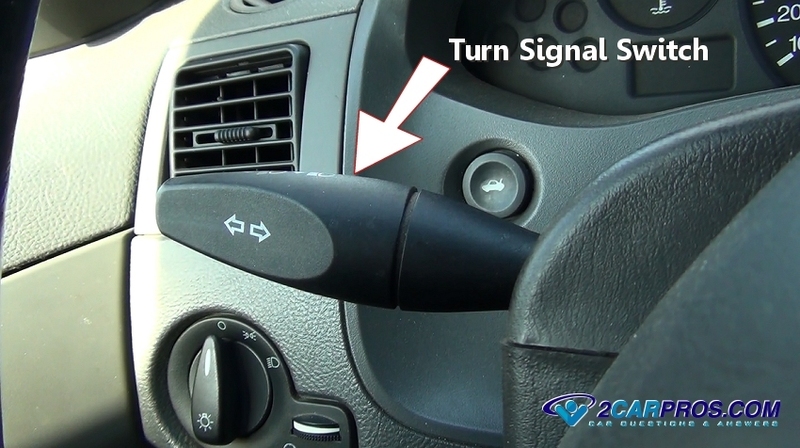 If not replace the turn signal switch, this is sometimes called a multifunction switch. 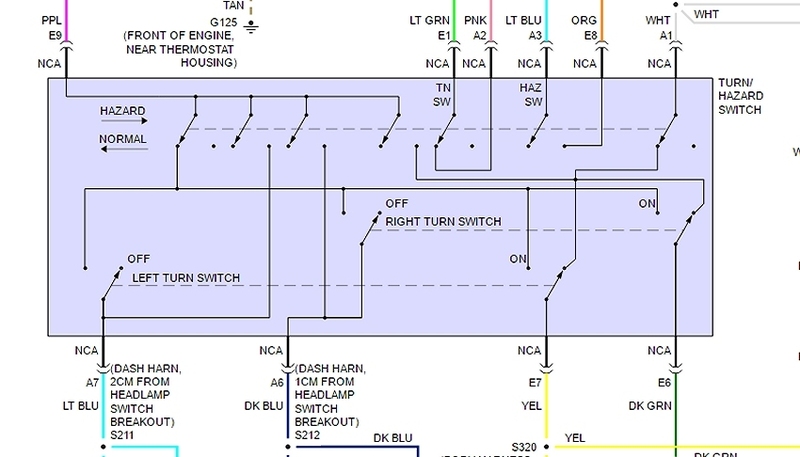 Here is a typical wiring diagram for a system which powers through a turn signal switch. Again YEL (E7) and DK GRN (E6) probe these wires while holding down the brake pedal. They should have power and if not the switch is bad and needs replacement. 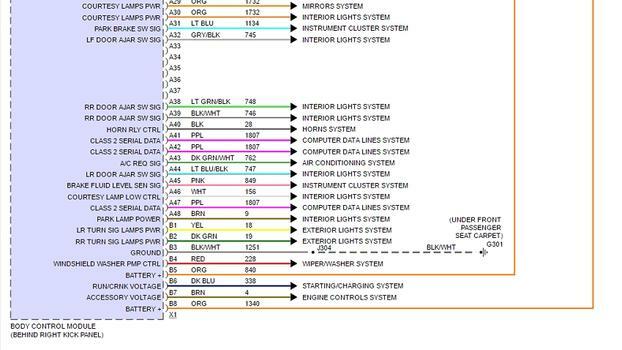 You can get a wiring diagram for your car from an online car repair manual such as Mitchell1 or search Google Images. A dim or dull brake light is usually caused by a bad ground or having the wrong bulb installed or the terminals of the bulb have melted together as in the image below. Remove the bulb and clean the socket terminals or replace the bulb and socket together which will facilitate a lasting repair. If you have any questions about brake lights please visit our forum. If you need car repair advice, please ask our community of mechanics is happy to help you and it is always 100% free.